This is a last-minute kids’ gift idea that tickles my lazy and my thrifty sides. Simply collect the ingredients together, layer them up in a jar, print out the labels and tie them to the jar. The mix makes a white chocolate version of Rocky Road that is jewelled with dried and crystallised fruit and warmed up with a little ginger. With a little help at the chocolate melting stage it can be mixed up by even very young children. I have used an Ikea Korken jar (second smallest size), which fits very snugly inside an Ikea Vinterkul tin, with a matching Vinterkul child’s apron. But, to be honest, that’s probably over-kill. It works fine just as a jar of the mix. In a food processor whizz the ginger nuts to a powder. Alternatively pop them in a bag and attack vigorously with a rolling pin. Fill a small cellophane bag with sparkly cake sprinkles. Don’t fill the bag more than half way and don’t fasten it right down at the top of the filling. You need to leave yourself wiggle space for positioning it in the jar. Do gently squeeze air out of the bag before sealing it with a little twist tie. Pop your snowy sprinkles bag inside the lid of the jar. Tuck the fastened end and the bottom of the bag towards you so that they don’t show from the outside of the lid. Layer up your jar in the order shown. The chocolate buttons should slightly overfill the jar and need to be pressed down slightly to close the lid. This will allow for the rest of the ingredients to settle a bit. Print out the labels on card. Cut them out and lay the Santa label over the Instructions label. With both labels lined up, use a hole-punch to punch a hole in them. Thread a ribbon through both holes and tie to the jar. 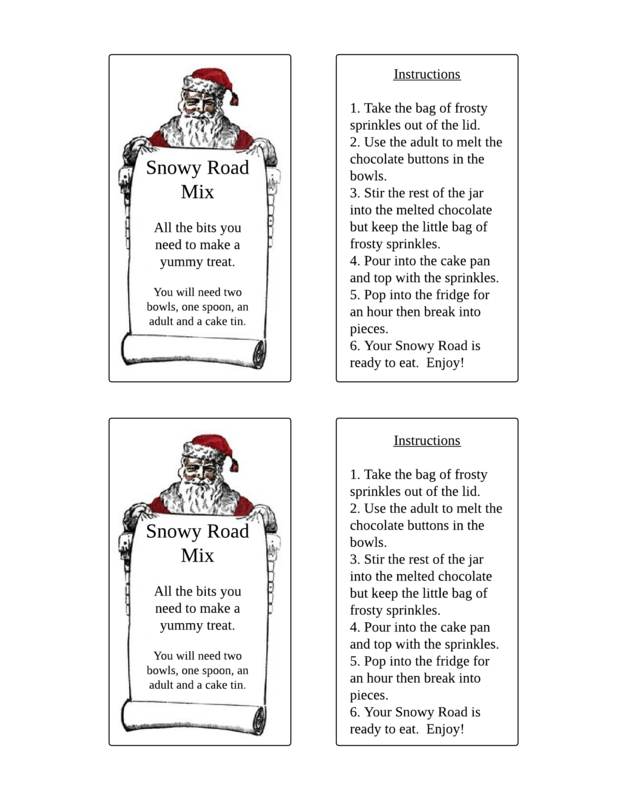 Of course, you could always skip the jar and just make yourself up a batch of Snowy Road to pop into little cellophane bags for giving. Or for selling at a Christmas Fayre. Or for eating, greedily, while watching It’s A Wonderful Life on DVD. Your call.